After the catastrophic flowered denim tote, Lanvin strikes back with this jeweled 'Nyota' shoulder bag that is burning with style. If you have a bag that is this gorgeous, you don't need an elaborate dress... a LBD is enough. You can have this at Barneys for $2,890. The first time I hear of Proenza Schouler when the Olsen twins wore the brand's shoes in one red carpet event a very long time ago. I check out their designs from time to time and I find them chic and wearable. School girl. Chic school girl. This saddle bag really reminds me of school girls... Japanese school girls in particular. I wonder if it, in any way, inspired the designers in making this bag. The strap can be removed, it closes via turn lock and has a jacquard interior. Everything is made in leather. You can have this bag at Barneys for $1,850 and this is also available in brown. If there's one thing that I remembered most about my teacher, it is her way of saying"Wrong spelling, is wrong." My favorite thing to do when I was in grade school was to spell words. I perfect each spelling quiz every time and I am proud of it. So, it's a little bit disappointing to see that Lanvin actually spelled Lanvin in this flowered denim tote as LANVIM. And they are expecting us to buy this for $1,745. Lanvin, like what my teacher said, "wrong spelling, IS wrong". I know it is a few months to go before Valentines Day but allow me to give you the splurge, save, steal edition of this blog for heart clutches. It isn't bad, anyway, to tote a heart clutch during Christmas and New Year's parties, right? 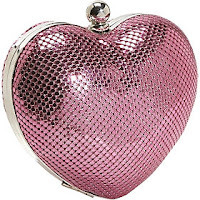 Judith Leiber 'Heart n' Soul' minaudiere with black Austrian crystals, $2,195 at Bergdorf Goodman. Also available in pink. 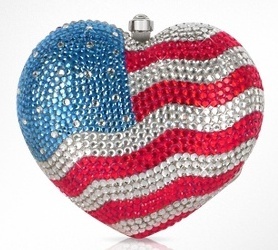 Forzieri USA flag heart clutch that is covered with crystals and Katy Perry approved, $630. Also available in gold. Whiting and Davies clutch, $101.25 at eBags.com. Also available in black, silver and red. Urban Expressions heart clutch, $29.95 at DSW. Also available in silver and black. I have never seen Hello Kitty wearing glasses before so I was surprised of this 'Nerd' plaid tote bag by Loungefly. It is cute that it brought me back to the days where owning any Hello Kitty item was a status symbol. If you still have that inner kid in you, you can have this for $52 at Torrid. I like love Marc Jacobs' bags. They are so stylish yet easy on the pocket. I have been wanting to have an Hermes 'Kelly' bag but in my world, it is equivalent to asking world peace. I am glad that there is a Marc Jacobs bag to alleviate the excessive wanting for an expensive bag. Here, 'Ozzie Square Lucy' satchel in its pink glory is so lust worthy. It is made of faux ostrich leather but who cares, it is simply gorgeous. And it doesn't look like it is faux. This is available at Zappos for $398. I like hobos, it is my preferred style when buying bags. I don't know exactly the reason for my being biased to hobos but anyway here are animal print hobos that are fierce and stylish... splurge, save, steal. Yves Saint Laurent 'Roady' leopard print hobo, $2,396 at Bluefly. 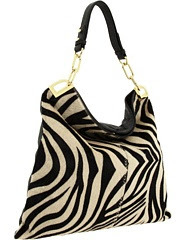 Badgley Mischka 'Gaia' zebra print hobo, $479 at Zappos. Marc by Marc Jacobs 'Hiller' hobo, $377.89 at My Theresa. 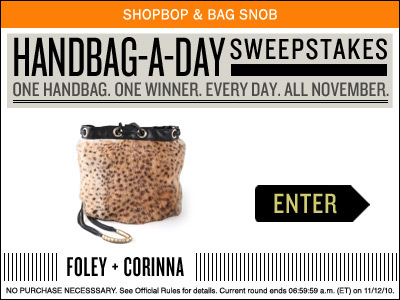 Shop Bop and Bag Snob joined forces to give away one bag a day for the whole month of November. My post is kinda late but there's still a week for you to join. Simply click on this link and submit your name. 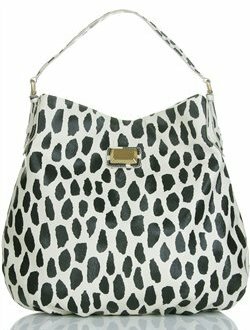 Today's bag is Foley & Corinna's leopard print shoulder bag. 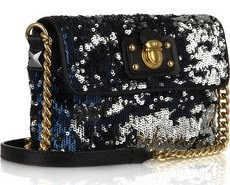 Wouldn't it be awesome if you have a glittery bag this Christmas? Wouldn't it be nice if it's this Marc Jacobs 'New York Rocker' bag? Normally, this bag costs $595 but it can be yours for free at The Outnet. Just enter your name and contact details and pray hard that this will be yours. You have a month to submit your entry. 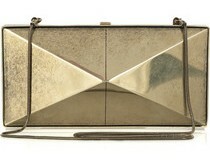 This metallic 'Element' clutch by Donna Karan will be up for bidding in two days at The Outnet. Originally, this clutch sells for $1,530. It is made of silver-tone metal with chain strap, square structure opening with clasp at the top and black lining. You like it? Click on the link for more details. 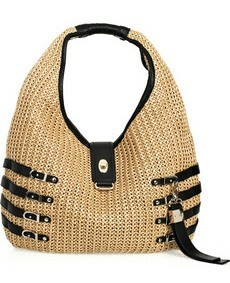 I feel like it is summer already with this 'Bali' raffia hobo by Jimmy Choo. The bag is made of woven raffia with side leather buckles and leather charm. It closes with a fold over strap with gold tone buckle detail. You can have this at Net-A-Porter for $995. Did it brighten up your day already? I was drawn to the bright yellow color of this 'Faithful' satchel by Alexander McQueen. It is a satchel that you can convert to a cross body bag. It looks really cute, isn't it? You can have this at Zappos for $1,030 or 50% off its original price of $2,074. What do you think of this bag? It is so intricately and elaborately designed, I wonder how many working hours the craftsman took to create this bag? As you can very well see, this 'Pearls of Wisdom' wristlet by Mary Frances is entirely made of pearls, beads and baubles. 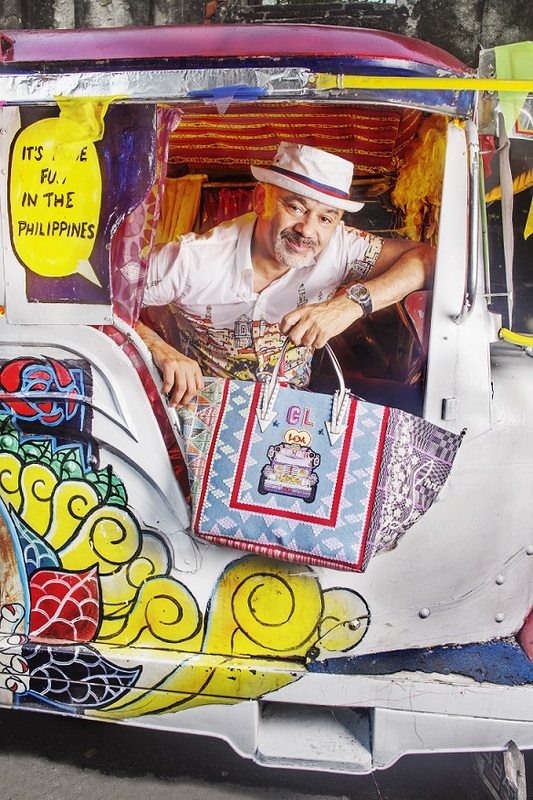 Oh, by the way, this bag is made in the Philippines--which makes it even more special to me because I am a Filipino. This would be your best accessory for special evening parties. Just this and your LBD... perfect. You can own this for $272 at Endless. I wanted to love this grosgrain flower tote by Lanvin. I really do. But, I am having doubts because the flower accent looks sad and wilted. I wish Lanvin perked it up a little. 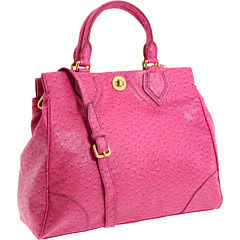 Anyway, this bag is available at Neiman Marcus for $1,790 and is also available in navy blue. After featuring Miu Miu's camera case bag in bright orange, here is another bright orange 'Genereux' shoulder bag by Lanvin. Who says bright colors are just for Spring and Summer? You can actually wear brights even during Fall and Winter. This bag for example can be your accessory during Yuletide parties. It is just the right size and the huge ribbon and charm are perfect to bring out the lady in you. This bag can be yours for $1,260 at Neiman Marcus.